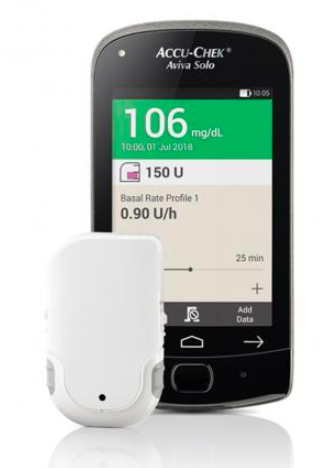 Roche announced that its Accu-Chek Solo insulin patch pump and wireless touchscreen handheld has received safety approval to launch in Europe. Like Insulet’s Omnipod, Accu-Chek Solo is a tubeless insulin pump worn as a patch directly on the body and controlled from a wireless handheld, enabling discreet insulin delivery. The pump will become available in Austria, Poland, Switzerland, and the UK beginning in the coming weeks. More European countries are expected in 2019. Roche plans to work with the FDA to bring the pump to the US at some point. The pump does not have a screen and is controlled wirelessly from a touchscreen handheld (via Bluetooth). The handheld also includes a bolus calculator and an integrated Accu-Chek Aviva glucose meter. Solo is “semi-disposable,” meaning the on-body patch includes a reusable component that lasts four months and a disposable component (including the adhesive, 200-unit reservoir, and infusion cannula) that is replaced every two to three days. In all, the on-body patch has five parts, meaning it is more complicated to insert and slightly larger than the fully disposable, fully integrated Omnipod. One advantage with Solo is that users can bolus from the handheld device or using buttons on the patch pump itself, a convenience win when the handheld is out of range. At this time, Solo does not appear to include a smartphone app for uploading data, remote monitoring, or controlling the pump. Solo also doesn’t integrate with CGM, and future automated insulin delivery plans have not been disclosed. However, a combination with Senseonics Eversense CGM – Roche’s partner – seems possible in future generations. A trial will begin testing patients in Europe with Senseonics’ 180-day CGM, TypeZero’s algorithm, and Roche’s tubed Insight pump later this year. For context, Roche acquired Solo in 2010, so this product has taken a long time to come to market. We’ll be interested to watch how quickly the limited launch expands in Europe, as Roche did something similar for its Insight CGM but decided not to fully launch the product.